Nebraska-Kearney extended its stay atop the Division II Top 25 Poll with four sweeps at the California Vulcan Invitational. Moving to 12-0 on the season, the Lopers collected 24 first place votes and 1,165 points to lead the way. Northern State hopped Concordia-St. Paul in the standings, rising from #3 to #2 this week. The Wolves, who notched two victories to remain undefeated on the season at 10-0, received 8 first place votes and 1,104 points. 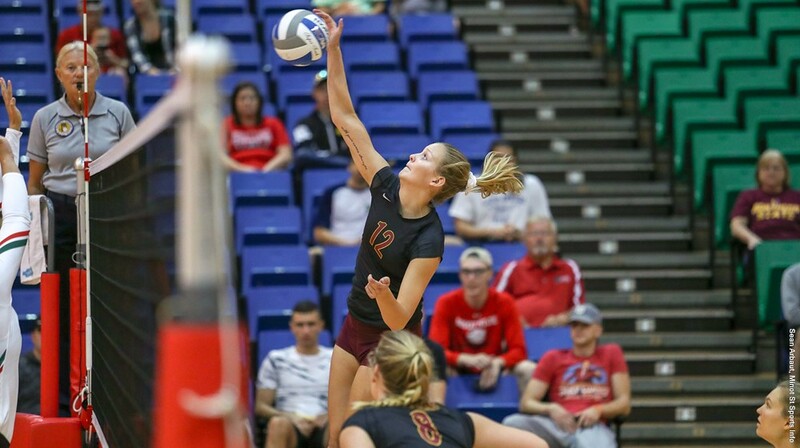 The two-time defending national champion Golden Bears earned two sweeps, one over (RV) Upper Iowa, picked up 6 first place votes and received 1,089 points in the poll. Palm Beach Atlantic (974 points) and Lewis (966) rounded out the top 5. Five undefeated volleyball programs remain in the AVCA Division II Top 25. #1 Nebraska-Kearney leads the way with 12 victories on the season, followed by #14 Gannon (11), #2 Northern State (10), #4 Palm Beach Atlantic (10) and #22 Cal State Los Angeles (10). New to the poll this week are #22 Cal State Los Angeles (10-0), #24 Findlay (7-1) and #25 Colorado School of Mines (8-2). Northern Michigan (9-1), Florida Southern (6-4) and Missouri Western (7-4) fell out of this week’s rankings. 11 teams mentioned on only one ballot for a total of 58 combined points.